soweit in der Sammlung vorhanden. as far as they exist in the collection. Viele der nachfolgenden Exponate stammen von Freunden und Bekannten - auch aus der IPA - die um meine Sammlung wissen. Ihnen allen herzlichen Dank. Many of the following exhibits come from friends, acquaintances and also the IPA – who know about my collection. To you all, thank you very much indeed! Auf meinen Auslandsreisen ist es mir immer wieder mal gelungen, das eine oder andere Stück zu tauschen. Several times on my foreign tours I have succeded in exchanging one or more pieces. .
Das größte Problem sind immer nur "halbe" Uniformen. Denn die Vervollständigung ist meist zeitraubend, teuer und ohne Internet einfach nicht möglich. Always the biggest problem are „partial“ uniforms. As completing them is mostly time-consuming, expensive and without the internet, simply not possible. Europa ist - hier links außen - mit Registerkarten nach Ländern unterteilt. Europe is divided – here on the left – with buttons for each country. 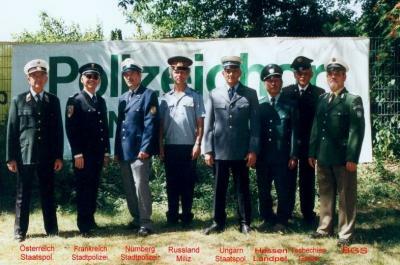 Singers of the Nuremberg Police Choir at the Police summer party.